Last month I was in Australia for their annual Lean summits – the Lean Thinking and Practice Summit (all industries) and the Healthcare Symposium. 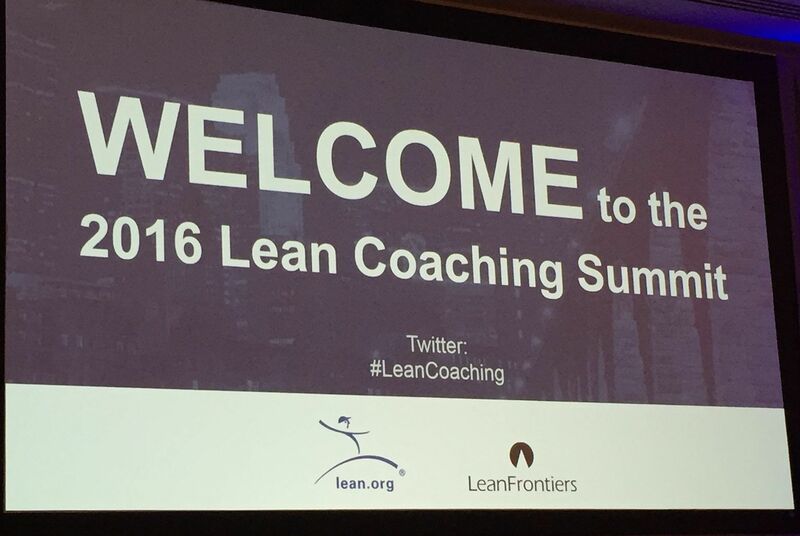 In addition to getting to meet with and hear from many fantastic international Lean leaders, I had the opportunity to contribute by speaking at each conference and teaching an all-day a class on “Coaching for Improvement”. I had a great time at the events – both contributing to the conferences as well as learning from others. I lived in Australia for over four years from 2002-2006 and I love getting back “down under”. Some of my next few posts will be about what I learned and shared in Australia. Visual summary of my talk “Leading Daily Improvements” at the Australasian Lean Thinking and Practice Summit by Lynn Cazaly. My plenary talk on Wednesday morning at the Lean Thinking and Practice Summit was about how leaders support continuous improvement. It was important to me to create a presentation that would would have a cohesive theme, but also be more “showing”, through stories, than “telling”, by just giving information. I wanted to make sure that I was demonstrating some of the very habits that I would be talking about! Lynn Cazaly, one of the Friday session instructors, made a one-page visual summary for each of the presentations at the conference. I really like this visual depiction as a way to capture notes. Below are the key points from my talk in a more expanded format. 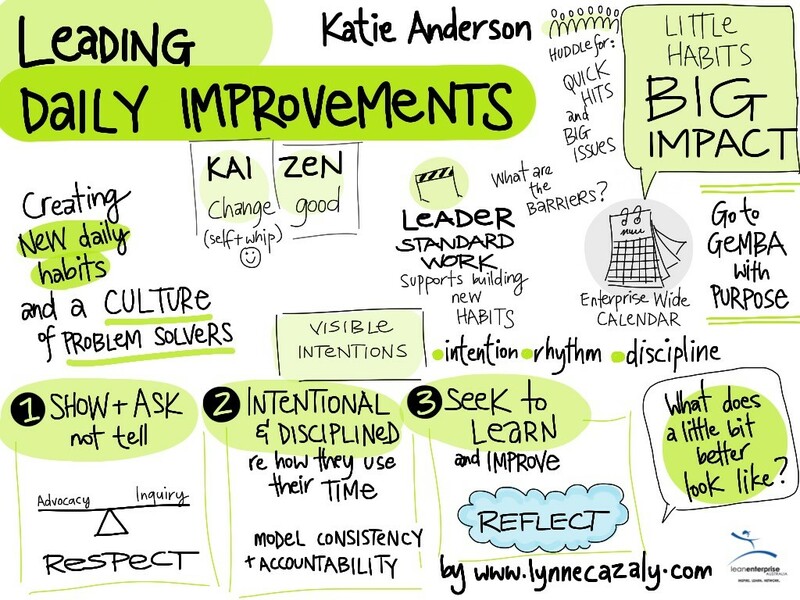 What habits do you think are important to create a culture of continuous improvement? Leave your comments below! 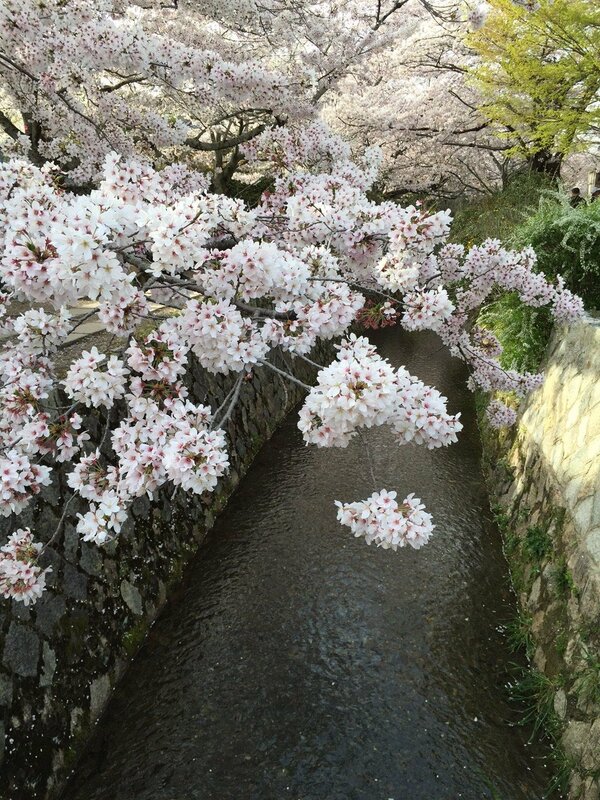 See my previous post on “The Real Meaning of Kaizen” to learn more. I shared the meaning of the meaning behind kaizen. 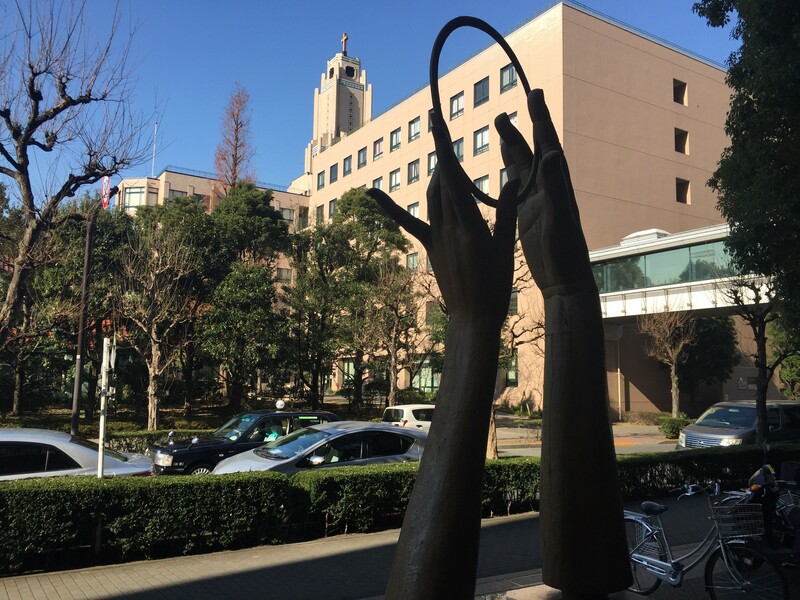 The word “kaizen”, that we have translated to mean “continuous improvement” in English, is made up of two kanji characters -“change” and “good”. 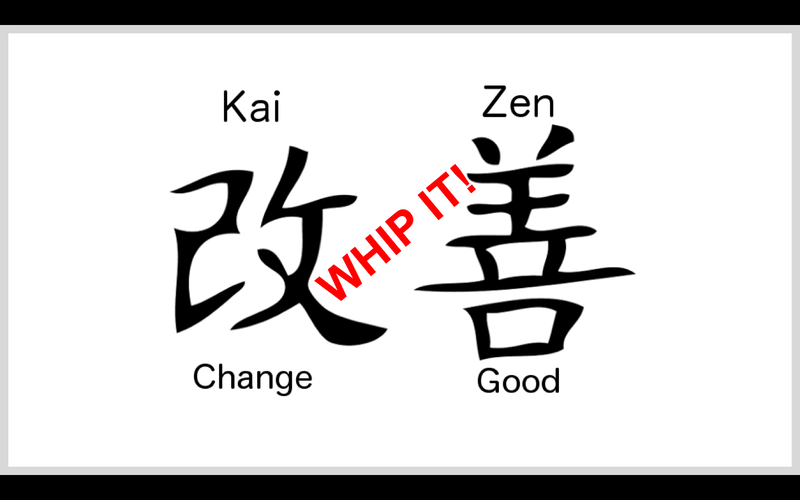 What I find interesting about the kanji for “change” is that it is made of of two characters meaning “self” and “whip”. So really, to create change, we have to whip ourselves to create new habits. We must have self-discipline to follow through and create the change. The conference organizers found the Devo song “Whip It” and closed out the conference day by playing the song while asking for everyone to write down the one or two new habits they were going to create following the conference. 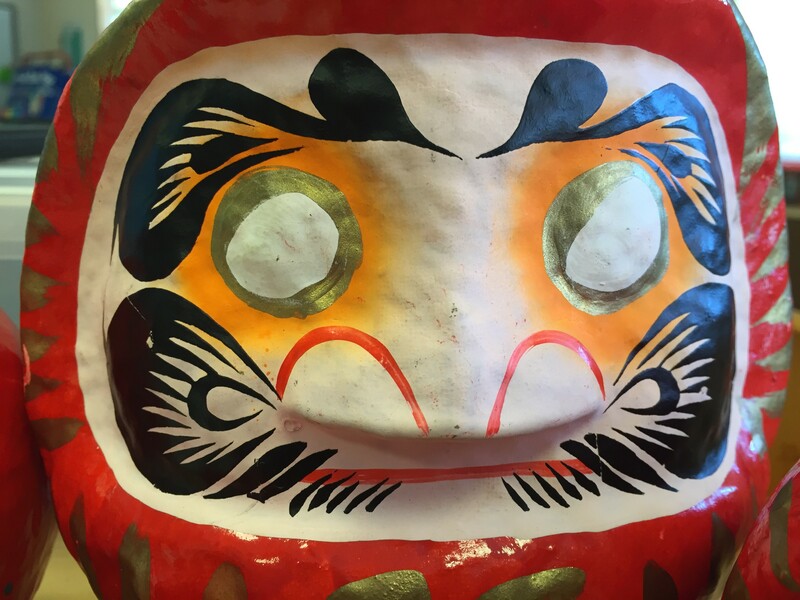 What a fun way to build on the theme of the event and my point about “kaizen”! When preparing for this talk, I wanted to focus on a few key attributes and actions that leaders take to create a daily problem solving culture. It all boils down to each of us individually creating new habits, in support of creating organizational change. 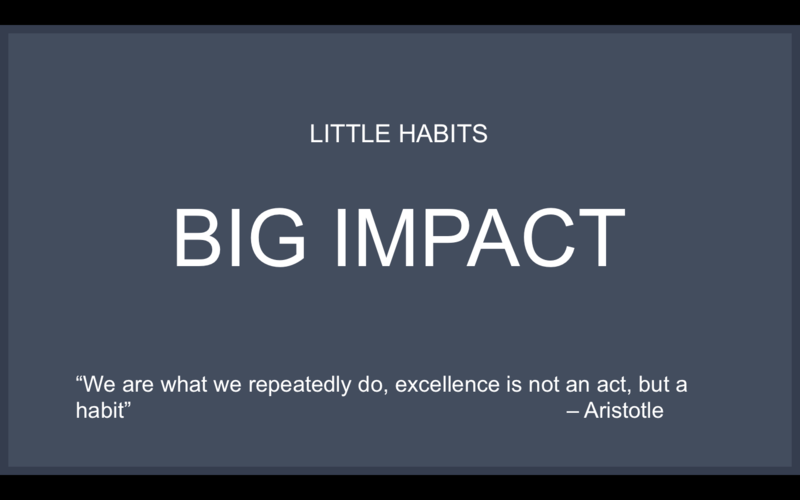 The theme of my talk was “little habits, big impact”. As I’ve written in the Lean Post, I believe that getting out of the habit of telling (as well as listening) is the number one habit leaders need to break if they want to create an organization filled with problem solvers. 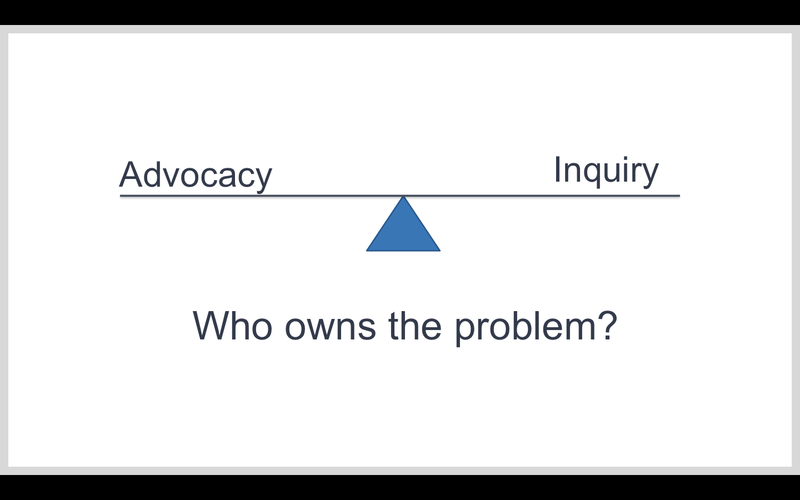 Advocacy versus Inquiry – both are important, but I suggest that there is an imbalance to how most of us show up. If we show up advocating for our own position too often, we miss out on opportunities to develop problem solving skills in others and often problem solving ends up being owned by just a few people. James Hereford, the COO at the Palo Alto Medical Foundation when I was the Director of the Lean Promotion Office, and now at Stanford Hospital and Clinics, consistently repeated the questions of: “Target, actual, please explain” when we would go to gemba. This refrain is engrained in my head whenever I think through a problem or support others in problem solving. 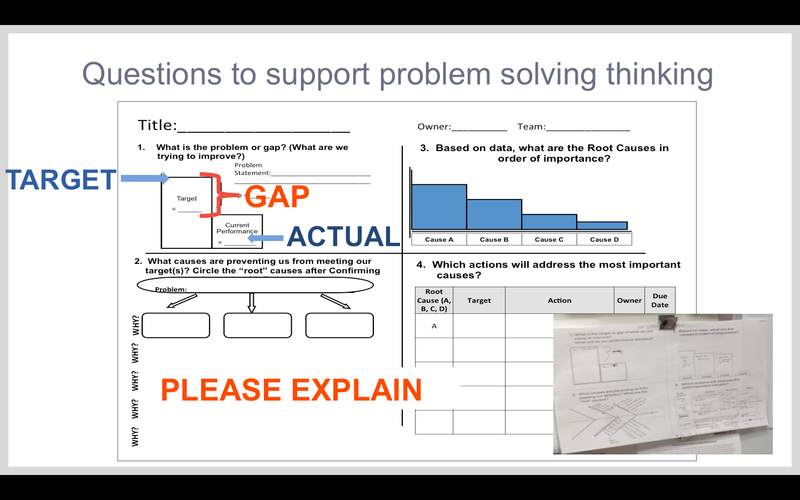 This simple template can support problem solving at the frontline. I also shared an example a simple problem solving tool that supports the plan-do-study-adust cycle. This is a simplified process of A3 thinking that can be used at the frontline. Click here to get a blank PDF of this simple problem solving tool and user guide. Managers can ask staff questions such as “What is your/our target? What is actually happening? What is your thinking for the reason behind the gap (please explain)”. I was excited to see Eastern Health in Victoria, Australia, using this tool (I had shared it in a session at the Australasian Lean Healthcare Summit in 2013) when I went on a gemba visit on Tuesday. 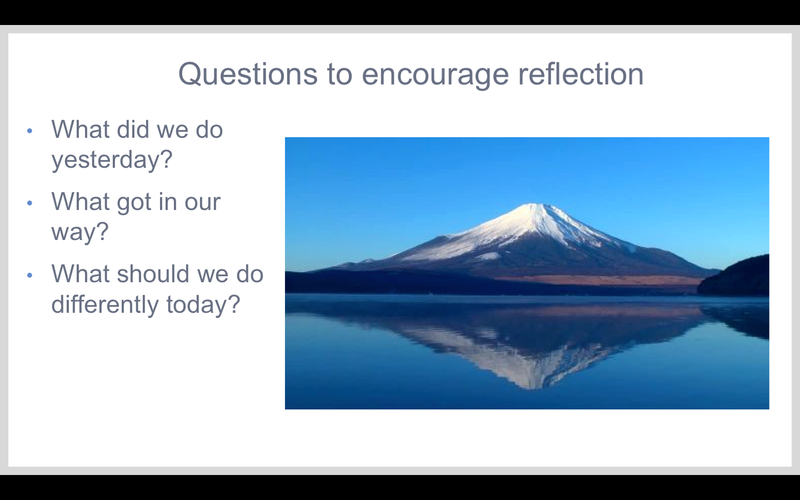 Ask questions to develop reflection as a habit. We can also ask questions to support reflection and learning. Most of us are better at Plan-Do, rather than Study-Adjust. It is our habit to move from one intervention or “solution” to the next without really learning from our prior experiments or actions. Where are there opportunities when you can lead by asking a question, rather than first offering your opinion? Make your intentions visible and use your leader standard work to develop discipline and reflection. 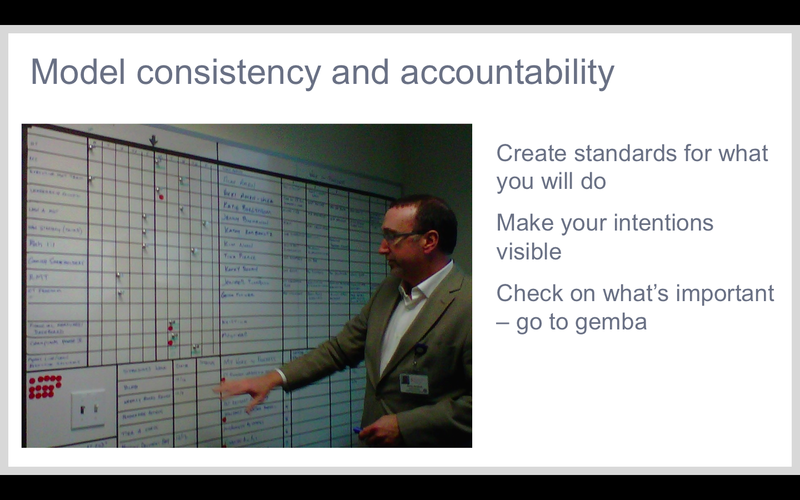 Leader Standard Work can help support the building of new habits by having a visual display of your intentions of what is important to check on, where you should be spending your time (go to gemba! ), and a process for reflection and learning about your leadership and management system. Through linked checking of leader standard work and the creation of no meeting zones to support time in the gemba, leaders can create organizational structures to support these new Lean leader habits. 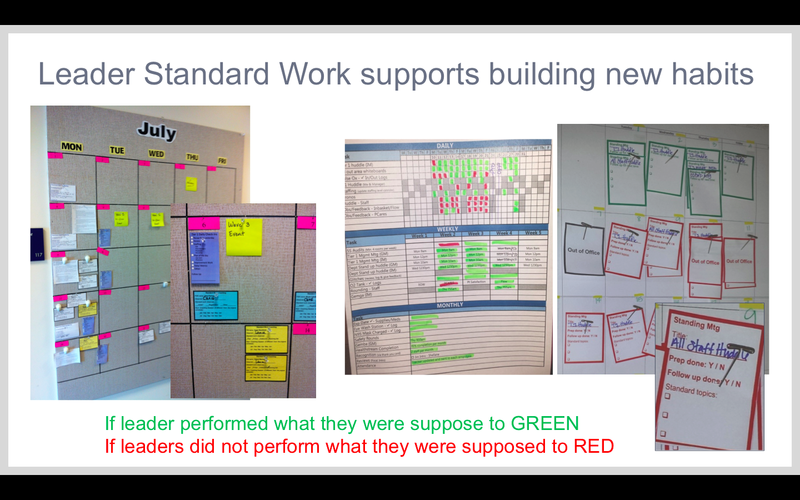 Examples of Leader Standard Work calendars at the Palo Alto Medical Foundation. Creating new habits requires intention and discipline. I shared some stories and examples of tools and practices that can support putting intention into practice. Where and how do you spend your time today? Where and how do you think you should be spending your time? 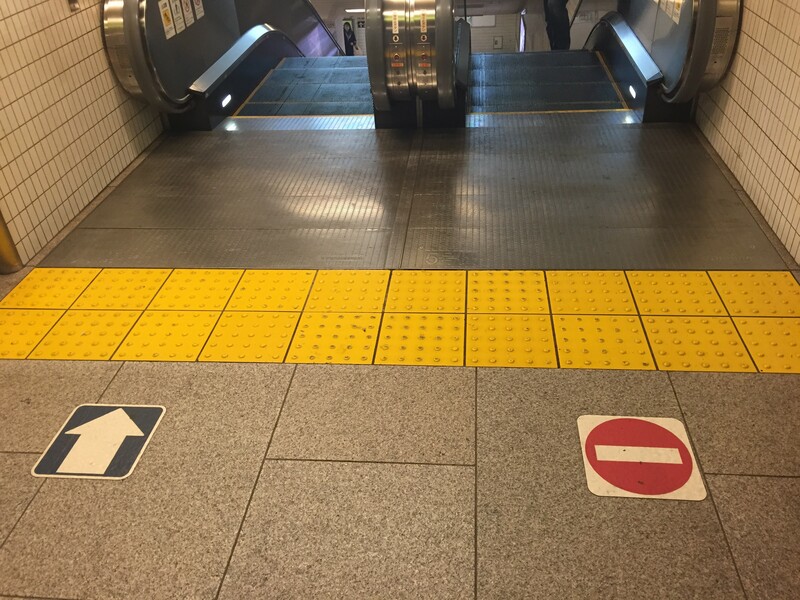 How can you set some intention to close this gap? Leaders who I have found successful in creating new habits to support continuous improvement in their organizations have all actively sought out improvements in their own behavior. They build in time for self-reflection and ongoing learning for themselves. 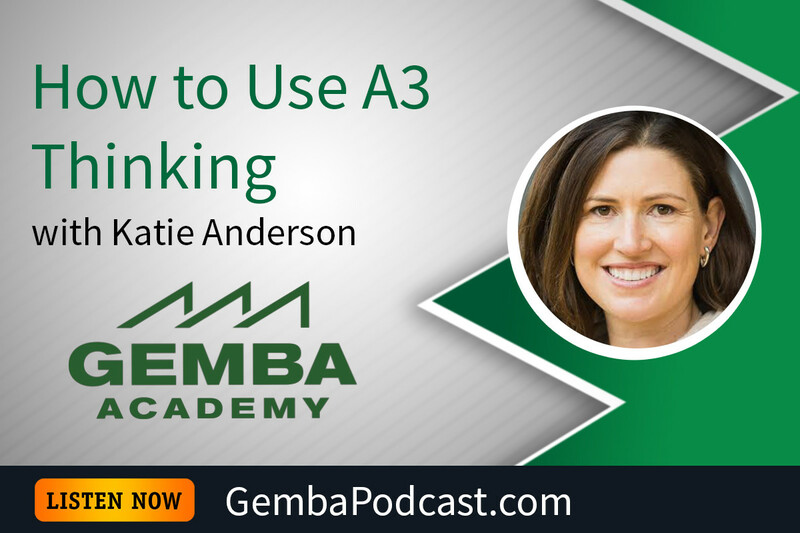 Practice A3 thinking on yourself. What are your gaps as a Lean leader? If you want to create an organization filled with problem solvers, then you also have to look at yourself and your own habits and actions. 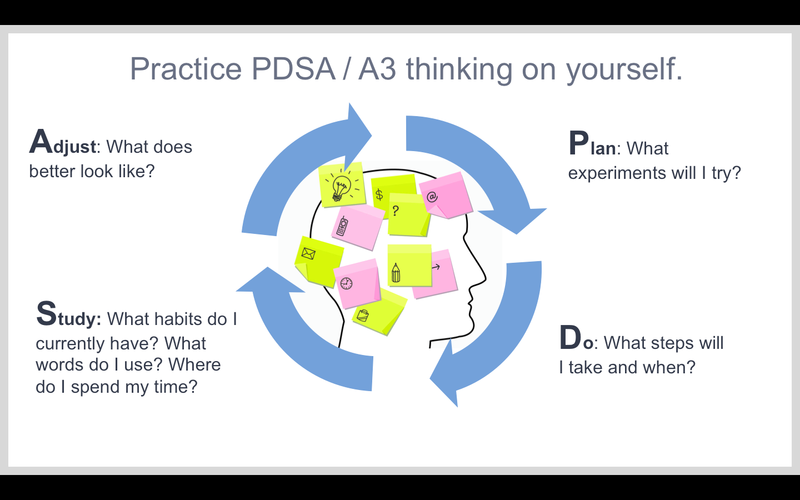 Click here to receive a free coaching guide I created to guide you or your learner through a personal A3 or PDSA problem solving process for personal development. What is your experience with creating new habits as a Lean leader? 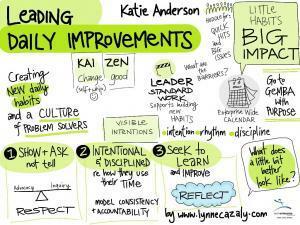 What do you think is important for supporting continuous improvement in your organization? How can you practice problem solving thinking on yourself to support the creation of new habits? What steps are you going to take to getting a little bit better today? If you enjoy what I’ve been writing about, sign to be notified of new posts as soon as they are published!